I did this on a bit of a whim, having been in Belfast for work, and wan't well prepared in terms of knowing the route, or having a map with me. I had some vague recollections of a route as described on MV, so parked at the Glenariff Forest Park, and once out at the main road, followed the waymarking signs for the Moyle Way. across the B14 and throught the forestry. Once out of the trees, it was just a matter of following the fence, which initially ran along the edge of the forest, almost right up to the summit. I wasn't sure what to expect as it has had some dire reviews due to its wet, indistinct nature. Maybe it was because I wasn't expecting much that I enjoyed Trostan so much. It was a pleasant walk up to and through the forest in the sunshne, and the forest was full of red mushrooms, adding a bit of interest. 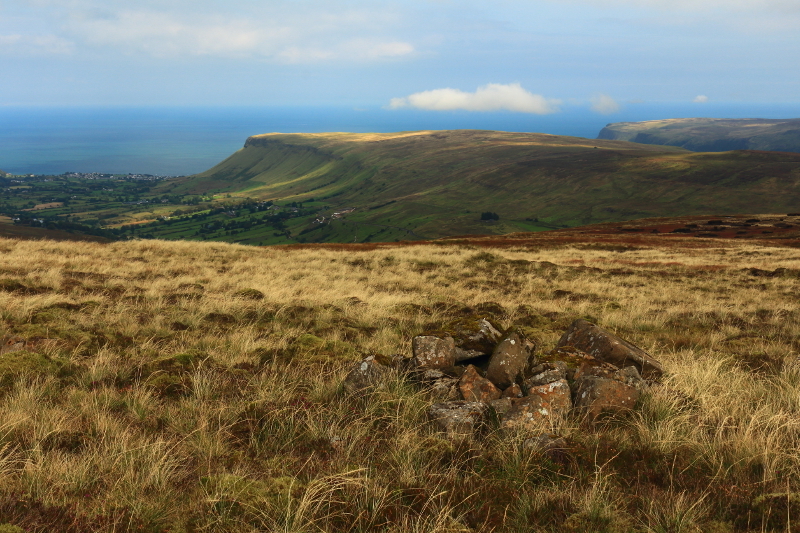 It has been fairly dry too recently, and as a result, the conditions underfoot were very good - not perfectly dry by any means, but I've definitely been through worse in the Bluestacks and Sperrins.